Toronto, ON: Doubleday Canada/Random House of Canada, 2008. I have a question, Renee said. Tonight, when you were talking to the people serving, you were speaking to them in Swahili. Not really speaking, just saying 'please' and 'thank you' and a few other phrases. So you knew what you were saying. Don't look so shocked just because I picked up a few words. That's not the part that shocked me. It's that I've never heard you be polite in English before, much less in a foreign language. Ha ha. Well, maybe I'm still waiting for you to do something that deserves thanks. Tell me, how thankful should a prisoner be to her keeper – no that's the wrong term – her warden? I'm not your keeper or your warden. This isn't prison. Club Med doesn't usually involve guards, electric fences, locked gates, and forced labour. I'm not sure if the work you did today could be called either 'forced' or 'labour,' she said. Alexandia, it's important that you know where you stand. What I'm going to put in the report for the judge. When 15-year-old Alexandria Hyatt is caught shoplifting again, not even her rich father and his lawyers can save her when she rubs the judge the wrong way. Luckily, she is offered a deal – instead of jail time she can choose to participate in a diversion program. If her parents agree to pay her expenses, Alexandria will travel to Africa and spend a month working with Child Save in Kenya. Needless to say, life at the compound is nothing like her privileged life back home. There is no cell reception and nowhere to plug in her hair straightener; she must share a tent and use communal showers that are often cold; and she is expected to work hard if she is to pass her diversion program. But these conditions are nothing compared to what she discovers when she goes to work on a new building for the local school and eventually goes home for dinner with a Maasai family. Primarily, Alexandria of Africa is a story of personal transformation where engagement with the realities of the larger world also inspire the first inklings of self-knowledge, where challenges bring untapped skills, courage, and integrity to the forefront. During the course of her work helping to build a new school, Alexandria befriends the daughter of a local chief, discovers a gift for picking up new languages, and slowly develops an appreciation for the many realities outside her small bubble. Alexandria of Africa may not be enough of a hard-hitting story for readers who have cut their teeth on the intensity of stories like Chanda&apos;s Secret (which chronicles the harsh realities of a 16-year-old girl dealing with the effects of the AIDS crisis in Africa). As such, Alexandria of Africa may appeal to an audience somewhat younger than the 15-year-old protagonist. But this story offers an accessible entry point for those curious about the dynamics of international development work, connection across cultural difference, and the profound effects of the global distribution of wealth and power. For younger readers curious about these issues, this novel might well be paired with the information book Ryan and Jimmy: And the Well in Africa That Brought Them Together. 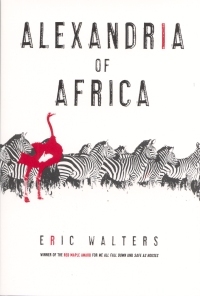 With more than 50 novels to his name, and numerous awards, Eric Walters is a seasoned writer. The book is plot-driven, highly readable, and seems well-researched. There is a short note at the back referring to the time Walters and his son spent working with Free The Children, the real-life NGO on which Child Save is presumably based. The basic premise of the story, however, remains difficult to believe. It is certainly possible that the plot reflects a real diversion program, but, as delivered in this novel, it remains unconvincing, and this detracts from the potential impact of the story. Regardless, the subject is compelling and important, and hopefully this novel will serve as a springboard to inspire readers to find out even more about the issues it raises. Anna Swanson works as a children's librarian with the Vancouver Public Library.